Frithjof Schuon’s essays on Shinto, included in Treasures of Buddhism (2003), are a record of Schuon’s discovery of two obscurantist like minds in Motoori Norinaga, about whom nothing more need be said for those familiar with this subject, and Genchi Kato, whose work I have summarized in a past essay. Schuon is writing about a subject he knows nothing about, so I will be brief. Repeating Norinaga’s unique and unjustified pseudo-Christian interpretation of the Kojiki, he seems to believe that the first kami named in the Kojiki is equivalent in the Japanese mind to the creator God, when in fact each national history assigns a different name and function to that original kami. This is irrelevant to someone who lives in the real world, though, because the closest thing to a “creator God” you’d find in the average Japanese mind is Mr. Sun (お天道様), who brings warmth to all human beings and is always watching over us. The Kojiki has been fussed over considerably by Norinaga, but we should be reminded that both it and the Nihon Shoki are first and foremost a record of the imperial ancestors and their noble deeds, and are cited in Japan’s traditional society for this reason and not for their mythical symbolism. He constructs an analogy between Japanese and Greek “myth”, which I have also taken a look at and found not very intellectually profitable. Anyway it seems that if this symbolism can be better understood by a foreigner than it can by most Japanese people then is really not relevant to how the Japanese tradition functions at all, and is the mission field only of syncretic religionists and people with too much time on their hands. This translation of Nobuo Ikeda’s blog post is released under a Creative Commons Attribution-NonCommercial license. I stole some of the text from Amptontan following the terms of this license. 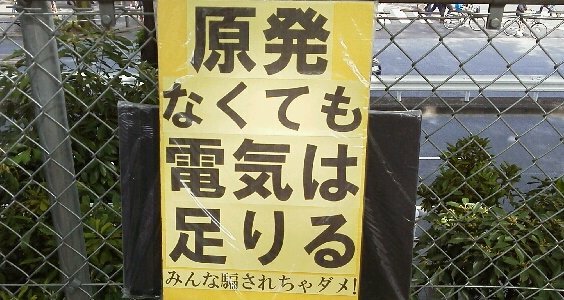 Photo: A nuclear protester’s sign, “we know you have enough electricity, stop hiding it from us!”, reveals the secret conspiracy of by Japan’s electric companies to drive themselves to bankruptcy. It seems like an anti-nuclear protest rose up in front of government offices last night. I had thought that these kinds of classical mass movements were already finished in Japan, but perhaps they were revitalized by social media in the manner of Occupy Wall Street in the United States. That in itself isn’t bad, but the objective of stopping the resumption of generation at the Oi plants is nonsense. The authorization has been issued and restarting work has begun, so according to the Electric Industry Law, it can’t be stopped without an order for technical improvement. Protests won’t stop it. If the protest was to keep other nuclear plants off-line, the economic hit from their idling would continue to grow from the 5 trillion yen ($62 billion) already lost. In other words, the demonstration was held to make Japan even poorer. The health risk of nuclear power is lower than that of steam power, so stopping plant operation doesn’t even increase safety. If the plants stay offline in this way, in a few years not only TEPCO but other electric companies will become insolvent. The only way to avoid that is to transfer costs to the consumer. If we imagine this as a consumption tax increase, it would be a 2% bump. Essentially, protesters have given themselves a totally different problem. The most serious crisis facing Japan now is the threat of becoming poorer tomorrow than we are today. The working population declines by 1% every year, while government debt grows by 50 trillion yen at the same rate. Nominal GDP last year was the same as it was 20 years ago, and the growth rate may soon turn negative. So, the lifetime disposable income of an average child born today will be more than 100 million yen ($1.25 million) less than that of an aged person who retires today. The manufacturing industry is rushing to move overseas to prepare for power outages this summer. Consumer electronics manufacturers and semiconductor makers are already drowning in debt. Talk to businessmen working in the manufacturing industry and the conversation turns to how long they will be able to stay in Japan. A protest clamoring, “stop our energy supply!” during such a time will likely be remembered as the final episode of stupidity in a once-prosperous Japan. The Communist Party has been putting up contradictory posters reading “Stop the nuclear plants, jobs for the youth.” This is ridiculous. If we keep the nuclear plants shut down, industries seeking cheap and reliable energy will be forced to move production overseas. I don’t see how young people could find jobs at all in that situation.